Beverly Hills Bike Shop features bicycles from the industry's leading manufacturers including Trek, Specialized, Felt, Dahon, and others. 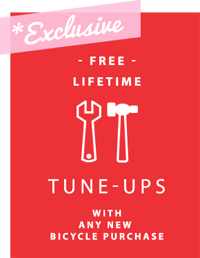 Always competitively priced, BHBS also provides free lifetime tune ups with every new bike sold! * In a landscape dotted with bike shops, BHBS remains the area's go to destination for every cycling need. Check us out and see why we pride ourselves as the unique neighborhood bike shop offering true world class service. * original owner, some fleet and/or commercial usage exempt. With our dedicated and knowlegable staff, BHBS remains a fixture in the area for over 28 years. In addition to sales to our thousands of local customers, we sell and ship bikes to all 50 states as well as countries around the globe. Do you have an older bike cluttering up your garage, or perhaps you wish to trade up after a recent purchase? We buy used bikes* and can also sell your bike for you on consignment. * with proof of ownership. Featuring thousands of items in stock or available for order from favorite companies such as Shimano, Campagnolo, Sram, Oakley, Garmin, Jandd, Hollywood Rack and Park Tools. We offer the finest selection in trunk and hitch mount carriers including free installation on any vehicle. Whereas most bike shops will not provide installation, we insist upon it to ensure the best possible fit and years of safe and reliable operation. Everything from casual wear to professional kit, including Shorts, bibs, tights, jerseys, shells, gloves, socks, and caps for men and women. The staff at BHBS will properly size and adjust your new helmet to your head. Even the best helmet will not offer adequate protection if not fitted and secured properly. Latest styles featuring Oakley and others. Most popular models from Bontrager, Specialized, and Shimano, for road, trail, city, or Spinning. We will install and adjust your existing or new cleats at no additional charge. With over 50 years combined experience our technicians can repair or restore any bike to factory spec, and get it looking like the day it rolled out of the showroom. Special services such as carbon repair, repaint and restoration, custom wheel building available. We provide quick turnaround, flat tires and many minor repairs can be done while you wait. Bicycle fitting is as much art as it is science. BHBS will fit you to your new bike as though you were poured into it. This service is provided free of additional charge when you purchase your new bike from us! Includes readjustments as necessary. Free delivery is always available with the purchase of a new bike** and pick up and drop off can be arranged for your bicycle service needs as well***. If you are moving, heading off to college, or embarking on a bicycle tour to some exotic locale, we provide box and ship services to any destination worldwide. ** free for ten miles radius, $25 charge applies for greater distances up to 25 mile radius. *** pick up and drop off $25 each way. We offer rentals by the day, week, or month. Our rates start at $25 per day. High performance and premium bikes range from $50 to $95 per day including repair kits and pedal system of your choice. We specialize in hotel, studio, and corporate rentals, and can provide drop off and pick up if necessary.